BELLOWS FALLS: Need a shot of Spring beauty? 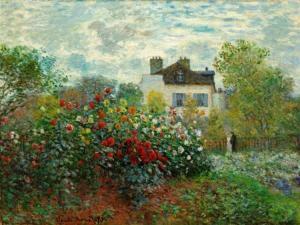 Come see the film that the Guardian called “A ravishing joy from start to finish.” Stone Church Film presents Painting the Modern Garden: Monet to Matisse, the next Exhibitions on Film screening, Friday, March 29, at 7:30 pm, in the Chapel at the stone church on the hill, 20 Church St., Bellows Falls. Claude Monet was an avid horticulturist and arguably the most important painter of gardens in the history of art, but he was not alone. Great artists like Bonnard, Sorolla, Sargent, Pissarro and Matisse all saw the garden as a powerful subject for their art. These great artists, along with many other famous names, feature in an innovative and extensive exhibition from The Royal Academy of Arts, London. "Exhibitions on Film™ is the originator and pioneer of bringing exhibition-based art films to the cinema. Working with top international museums and galleries, Exhibitions on Film create films which offer a cinematic immersion into the world’s best loved art, accompanied by insights from the world’s leading historians and arts critics. Since launching in 2011, Exhibitions on Film have released 16 films which have been shown in over 50 countries across the globe and over one million seats have been sold! This is a wonderful resource for audiences worldwide – from Caracas to Cape Town, Berlin to Brisbane. Executive Producer & Director Phil Grabsky has been making documentaries for 30 years and is a multi-award winner. For the past 15 years he and award-winning director David Bickerstaff along with their colleagues have been both a major independent producer of arts films for TV as well as a pioneer (and largest producer) of cultural documentaries for the cinema. EXHIBITION ON SCREEN has extensive relationships with galleries around the world. Stone Church Film presents “Painting the Modern Garden: Monet to Matisse” Friday, March 29, at 7:30 pm, in the Chapel at Immanuel Episcopal Church, 20 Church St., Bellows Falls. Tickets are $10 and are available in person at Village Square Booksellers (Bellows Falls), Misty Valley Books (Chester), by phone at 802-460-0110, or online at www.stonechurcharts.org.